at one time this place must have been a wonderful garden. Now it all needs care and divisions. Though I have a plant that I have not seen before. 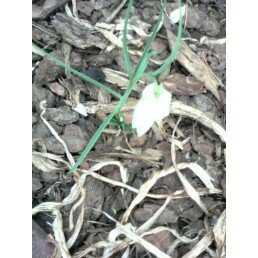 I thought it was grass and almost weeded it out before noticing that it had a flower bud coming on. It has a pendulous cream colored flower that looks like an upside down tulip. The flower is about two inches long. And the dogs ate it!!!! The plant looks intact but the flower was shredded. I have a pic that I took with my cell phone (oh look... if you like it... it must taste really good) so if anyone might know what it would be please let me know. I have a baby sweater on the needles but really no urge to knit right now. Finishing up the gold and green crochet back pack by lining it. Picks tomorrow.